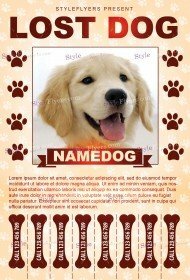 It doesn’t really matter whether you need the flyer for your missing pet flyers or you are looking for pets adoption advertisement, our category is ready to satisfy any your need. 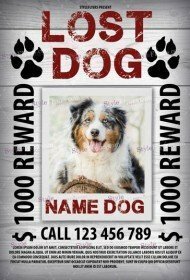 Our free pets PSD flyer template can be easily customized so you can add your content (photo or text content) and complete the flyer. You can print any flyer out and spread it over the streets or you can opt digital way of distribution and use our Facebook cover for social media networks. Each design here is unique and professional, so you can just add the necessary photo of your pet and add some description but don’t make any crucial customizations! In case you want to change some object besides the photos and text, you can do them after downloading. Enjoy our free flyers with the premium quality and we are pretty sure that you will find your lost dog or find the new home for your new born pets. An appropriate flyer is a half of the success.